Seems Best Buy took a cue from Japan’s vending machine addiction. 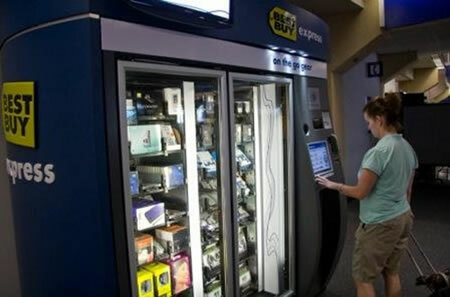 In the Dallas/Fort Worth airport, someone spotted this new Best Buy Express vending machine. They are located at Terminal B’s Gate 29 and Terminal E’s Gate 32. What’s inside? Since this is Best Buy’s vending machine, it obviously has electronics. You can purchase IPods and accessories, Nintendo DS’s, MP3 players, and wireless headsets among other electronics. Best Buy doesn’t expect you to put quarters in this vending machine. They do provide a convenient credit card machine so that you can spend hundreds of dollars in the blink of an eye. I’m not sure how logical the MP3 players are in this machine. Unless you either have a laptop to put songs on the MP3, or are using the player as a gift at your destination, is it really worth buying? Still cool though. Would you use origami dishes?